PATIENT HISTORY: The specimen was obtained from a 2 day old baby who showed respiratory difficulty from birth. Both kidneys are grossly enlarged (cf. normal baby kidney in the centre). The outer surface shows foetal lobulation and is studded by numerous pin-point cysts. On the cut surface the cysts are better appreciated. In the cortex they are predominantly linear and at right angles to the surface. In the medulla they have reached a bigger size and assumed an oval or spherical shape. The medulla shows areas of congestion and a few cysts can be seen to be dark brown to black in colour due to altered blood. Microscopic cysts were also present in the pancreas and liver. The liver showed in addition fatty change, portal fibrosis and bile duct hyperplasia. 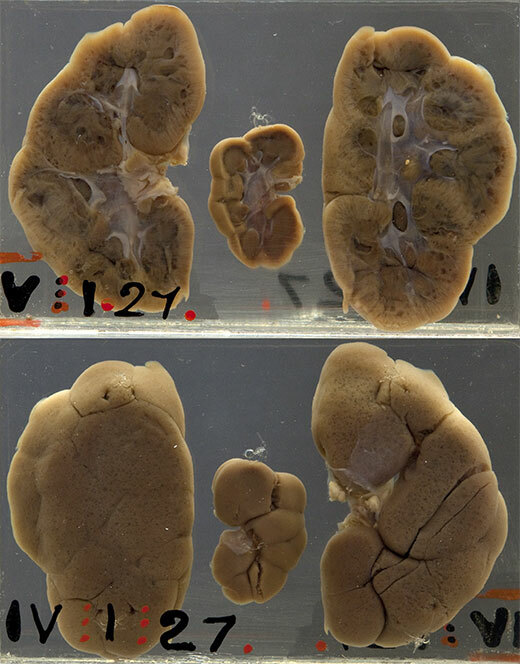 This is a case of autosomal recessive polycystic kidney disease (ARPKD) which frequently presents in the perinatal period. In severe cases there is massive renomegaly with lung hypoplasia and mechanical interference with respiration and therefore respiratory distress. The mortality is high when the presentation is this early. In cases that present in later infancy there is a progressive deterioration to end stage renal disease. ARPKD is associated with hepatic fibrosis which leads to portal hypertension. ARPKD is caused by mutation in the PKHD1 gene which codes for a protein called fibrocystin. Fibrocystin is thought to have a role in renal collecting duct and biliary duct differentiation. On microscopy of the kidney there is saccular dilation of the renal collecting tubules. These patients need chronic dialysis and are candidates for liver and renal transplantation. The other more common cause of polycystic kidneys is autosomal dominant polycystic kidney disease (ADPKD) which affects at least 1 in 1000 live births and accounts for about 5% of cases of chronic renal failure requiring transplantation or dialysis. In this disease the gene mutation is in the PKD1 or PKD2 gene which codes for a protein called polycystin, which seems to reside in the cilia of tubular epithelial cells and have a role in regulating intracellular Ca2+. Many patients with ADPKD remain asymptomatic for many years until presenting in adulthood with symptoms such as haematuria, kidney pain or hypertension. The kidneys are usually massively bilaterally enlarged, with cysts a few centimetres in diameter. On microscopy there are functioning nephrons between the cysts. In these patients it is important to know that there may be extrarenal anomalies, in particular intracranial berry aneurysms. 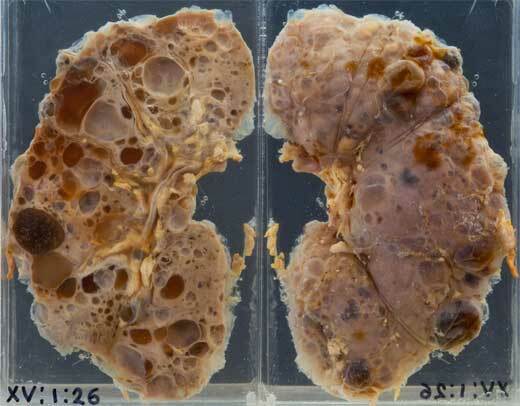 This example of adult polycystic kidney disease is from a woman of 55 years who presented with mild anemia.